In January, 2003 the Olds Lions Club took over the operation of O.R. 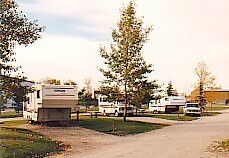 Hedges campground in Olds, Alberta. 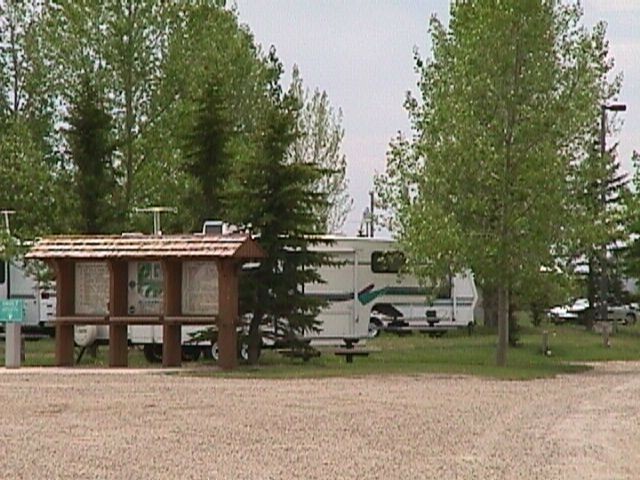 This campground is located on 54 Street west of 50 Avenue and across from the Olds Agricultural Society fair grounds. 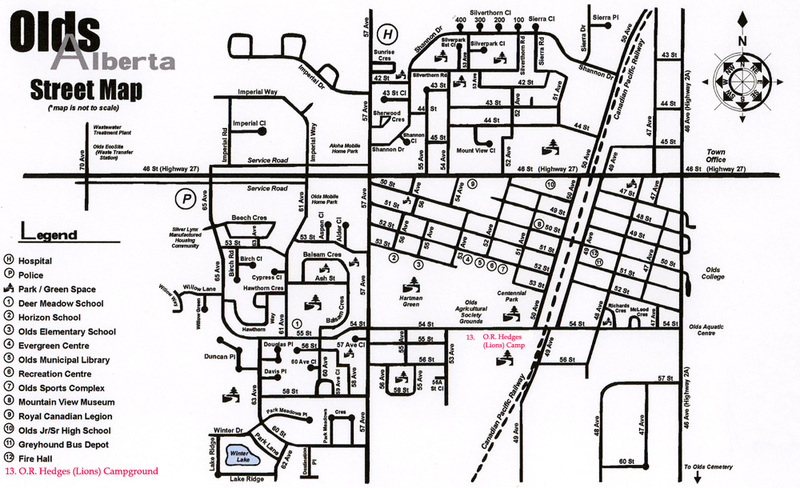 For those of you who navigate by GPS the street address is 5013 - 54 Street, Olds. There are 42 serviced sites as well as an overflow area. We have recently laid out 5 new pull through sites on the north end of the campground. These are not serviced sites but will have picnic tables and fire pits in each one. For sanitary reasons livestock or horse trailers are not allowed to park in the campground. PLEASE NOTE ... there are some changes to this map. The Olds Jr./Sr. highschool is no longer at the location noted on the map. A new highschool has opened just south and east of the Aquatic Centre. YES we do take reservations. You may call (403) 556-2299 after May 01st. to confirm if there are sites available and to make reservations. WHILE THIS CAMPGROUND HAS A TRAILER SANITATION SITE WE WOULD LIKE TO ADVISE CAMPERS PASSING THROUGH OLDS THAT THE OLDS LIONS CLUB HAS PROVIDED CAMPERS WITH AN ALTERNATE SITE ON THE WEST SIDE OF OLDS JUST BEHIND THE U.F.A. BULK KEY LOCK STATION LOCATED ON THE NORTH SIDE OF HIGHWAY 27. IT IS VERY ACCESSIBLE. IF YOU ARE ENTERING OLDS FROM THE WEST THEN TURN LEFT AT THE SECOND SET OF TRAFFIC LIGHTS YOU COME TO. IF YOU ARE TRAVELLING WEST OUT OF OLDS THEN TURN RIGHT AT THE TRAFFIC LIGHTS AT THE U.F.A. BULK KEY LOCK STATION. THE SANITATION SITE IS JUST NORTH OF THE BULK STATION. Olds has just about every major store chain within its borders. All of these amenities are within easy driving. One of the best golf courses in Alberta is located two miles east of town on Highway 27. 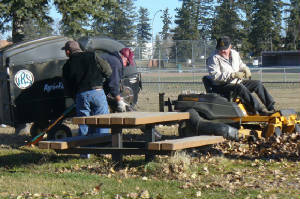 The Knights of Columbus and the town of Olds have built a skateboard park in Centennial Park. That's about 100 meters to the north east of our campground. It was opened in the late fall of 2010. Our new library opened its doors on November 01, 2010. It is situated just west of the Olds Sports Complex directly north of the campground. It has wireless services, video conferencing, VERY high speed internet and VERY courteous staff to help you find what you need. To go to our library web page click here. You will find our camp office just to the left of the rules sign and map pictured above. 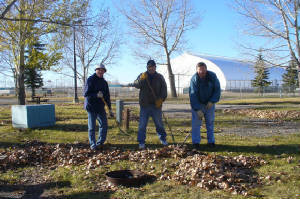 Keeping the campground clean and free of leaves is a big job every fall. This year was no different but we were able to get the job done before the leaves were buried by snow.